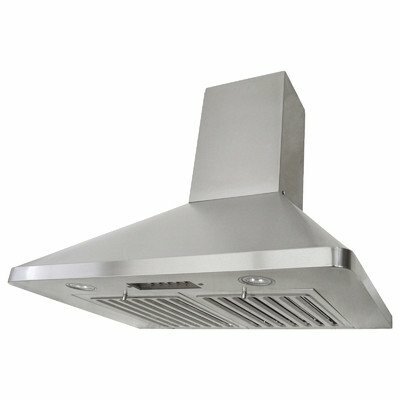 Brillia 30" 680 CFM Ducted Wall Mounted Range Hood Height: 56.2"
Product prices and availability are accurate as of 2019-04-21 20:24:33 UTC and are subject to change. Any price and availability information displayed on http://www.amazon.com/ at the time of purchase will apply to the purchase of this product. RAX9430SQB-DC30-1 Height: 56.2" Features: -Brillia collection. -18-Gauge commercial grade stainless steel. -680 CFM internal blower. Product Type: -Wall mount. Finish: -Stainless Steel. Primary Materials: -Steel. Number of Items Included: -2. Lights Included: -Yes. Blower Type: -Interior unit. Dimensions: Overall Width - Side to Side: -30". Overall Depth - Front to Back: -22". Height 56.2" - Overall Height - Top to Bottom: -56". Height 56.2" - Overall Product Weight: -40 lbs. Height 73.2" - Overall Height - Top to Bottom: -73". Height 73.2" - Overall Product Weight: -42 lbs.